The past couple of weeks have again been action packed at Sleaford Golf Club, with a busy schedule of matches and competitions. The Ladies’ Club Championship was played over 36 holes, with Ann Lyon emerging as a worthy winner with the lowest gross score from Gill Lamming in second place. New member Izzy Stone claimed the Ladies’ Handicap Trophy for the best nett score, with Wendy Lawson in second place. 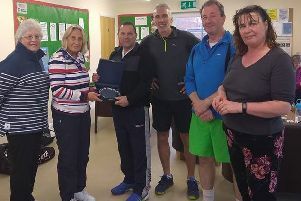 * The seniors played their big betterball competition, the George Collier Trophy which was won by Gerry Walsh and Peter Wheeldon with 44 points, Mike Duncan and Gordon Donaldson took second place after a countback, with 42 points. * The men’s June Medal winner was Gil Thomas with a nett 70, beating Ben Allen and Pete Tucker who both had nett 71. Mark Gee, meanwhile, topped the June Stableford with 42 points from runner-up Callum Morrison (41pts), while Phil Sneath won Division Two with 37 points. * The ladies also played for the Mountain Cup (for Division One players) which went to Gill Lamming, with Sharyn Gamble in second place, after both recorded rounds of nett 72. The Kefford Cup (for Division Two players) was won by Jennifer Stubbs, on nett 74, with Sally Downey in second place, three strokes back. * Match fortunes have again been mixed. The latest A team match, at home against Belton Park, ended in a 3-3 draw, while the B team’s match was cancelled after scheduled opponents Toft, withdrew from the league. The seniors recorded a three-and-a-half to two-and-a-half win at Spalding, followed by defeats at South Kyme (5–3) and Newark (4.5-3.5). The ladies, meanwhile, halved their home Handicap League match with Woodhall Spa, lost the return at Woodhall 3–1 and then beat Lincoln at home 4–0.